There are many ways to feel about this 1980 Chevrolet Corvette listed for nearly $217,000, mainly because it doesn’t look like most other Corvettes—from its time or from any other. What you see here, friends, is a Corvette with two extra doors and ample seating for four, all for about double the base price of a 2019 Corvette ZR1. But unlike the 755-horsepower ZR1 and very much like the majority of us feel when we look in the mirror, this Corvette looks good at some angles, alright at others and slightly scary at more than we’d like to admit. It’s the Corvette sedan of your dreams, or your nightmares. It all depends on where you look. Motor1 found this 1980 Corvette sedan and its pixelated ad photos listed online by California’s NBS Auto Showroom, which clocks it in at 20,000 miles on the odometer and a whopping $216,427 out of the pocket for someone who wants it badly enough. The showroom lists the car as having an automatic transmission and the 350-cubic-inch V8 engine Chevy used in most C3-generation Corvettes, which doesn’t say much about its power: As Edmunds notes, that V8 came in both 190- and 230-HP trims. What makes this Corvette worth $217,000—at least, in the eyes of the seller—isn’t the power, though. It’s that, according to the sale listing, only six of these C3 sedan conversions were done and only two are left due to the others being crashed or totaled. The listing also says the car has always been garage kept and driven mainly to car shows. 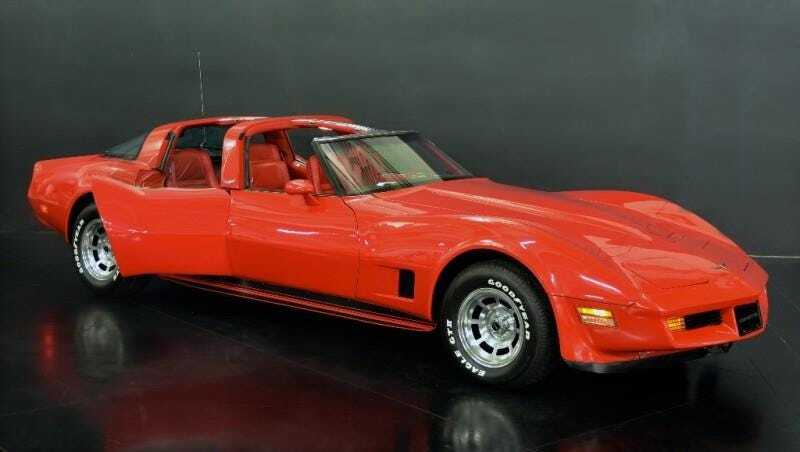 Old eBay listings back the limited-run conversion story up, like the one for this more beat-up 1979 Corvette sedan conversion claiming it was part of that same group. The car was listed for $65,000 last year, as found by Carscoops at the time. The one for sale now looks to be the same one that was for sale on eBay in 2010 for a calm and cool $300,000, so it’s basically on major sale now. That’s still a whole lot of cash for two extra doors and exclusivity, when a whole lot of power can be had for less with plenty of other Corvettes. But if you can afford a $217,000 C3 sedan conversion, you can probably afford another Corvette with more power, albeit fewer doors, to sit in the garage beside it.